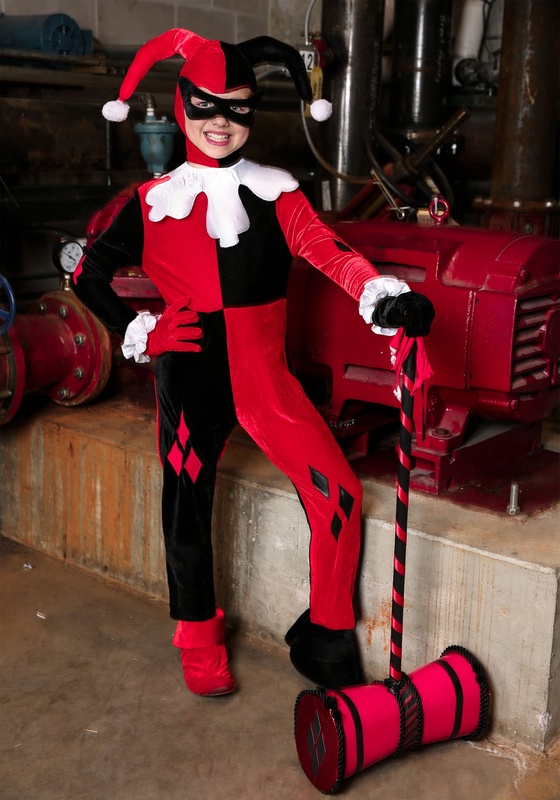 This kids Harley Quinn jumpsuit costume recreates her classic costume from the cartoon series. It comes with a black and red jumpsuit, which has diamond designs on the legs and arms. A flowery white collar and matching white cuffs add that oh-so-playful pop to the outfit. The hood also has the matching black and red style and has two large pom poms that dangle down on each side. 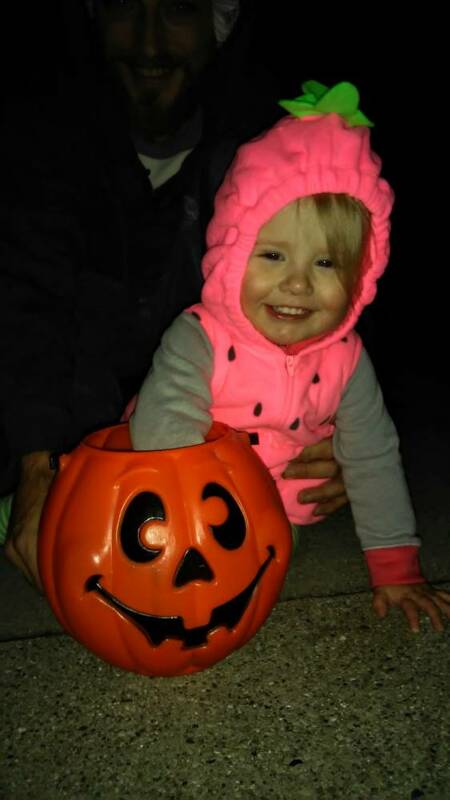 The matching gloves put the finishing touch on the costume, helping your child feel like the super villain that she's always wanted to be! 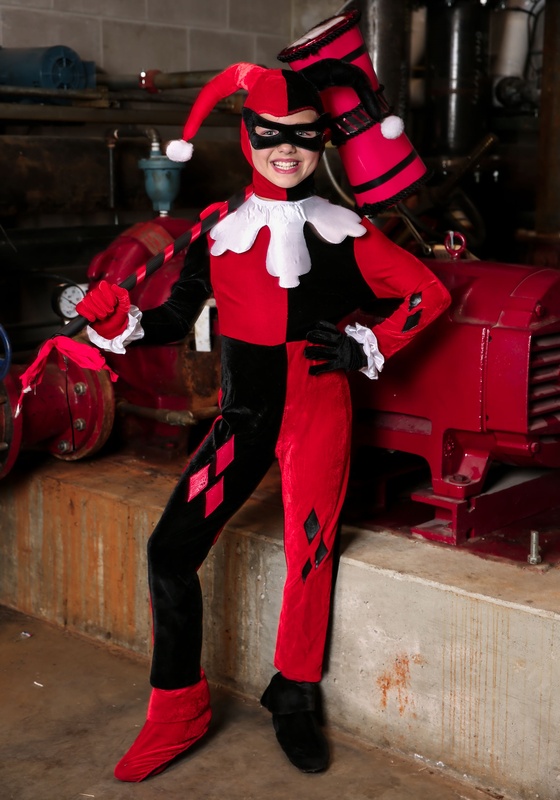 We know it might be hard to accept that your young one wants to be a villain, but there are ways that you can transition into this new phase of her life! 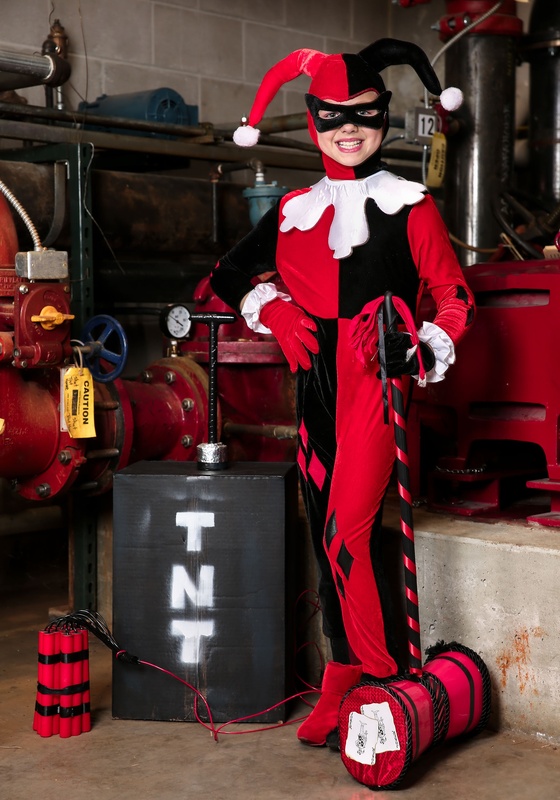 First of all, make sure you add a mallet or a baseball bat to your order, since Harley always needs her favorite toy weapon around when she's up to no good! 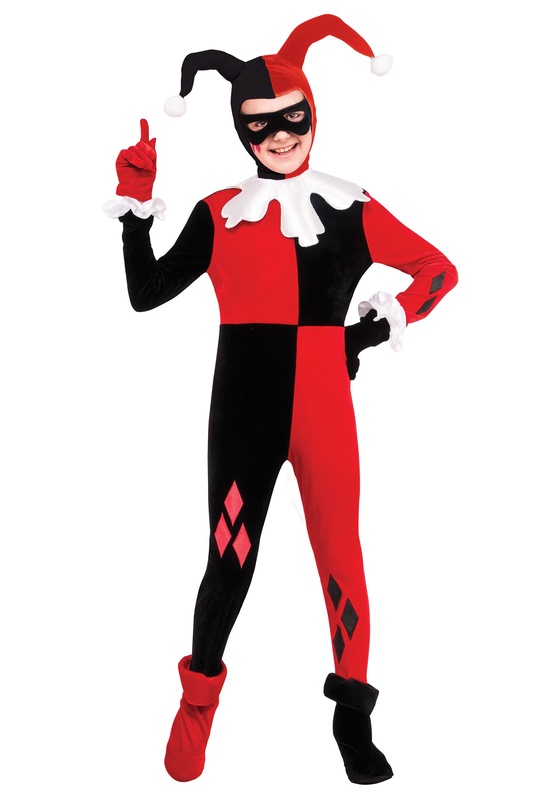 You could even find a super villain costume of your own and join her in a villainous escapade. Or, you could grab a Batman or Batgirl costume to begin training your little one how to fight superheroes before her big debut as DC's baddest female villain! i want to win this for my 3 year old Jameson really bad! Please pick me! I bought this for my youngest sister, who is 10 yo. I took her measurements and she was between a M and a L. We went with a L, which was still a little snug but fit well. It was a tad long on the arms and legs, but she's very tall for her age so it fit perfect. It might be a little too long for shorter children. The costume came with everything we needed, including the gloves, which I did not realize were included. She wanted to go for the original Harley Quinn look, and she loves it! For everything it came with, it was well worth it! costume was exactly what we expected, fit was perfect, material was great!! Received within a couple of days. Could not have been any better! !